People are fond of saying that the unrestricted Group B rally cars of the '80s were like Formula One cars that ran on dirt. This Peugeot shows that was more true than you might think. Do you see that extra low bar of teal? That's a ground effects skirt, just like the ones used in Formula One in the very late '70s until they were banned at the start of the '80s. 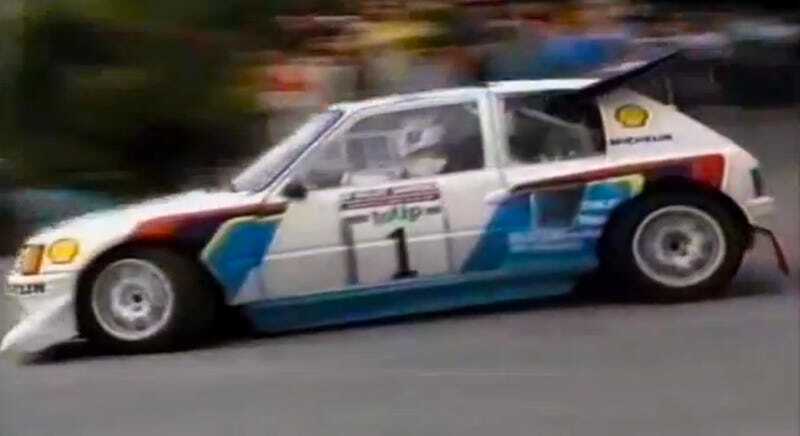 You can see the car in action at the 1986 Ralye Sanremo here. This information comes from Derek Dauncey, who currently run's Ken Pocky's Hoonigan Racing team and worked as a part of Mitsubishi's works Ralliart team through the 1990s and into the early 2000s, winning one constructors title and four driver's titles with Tommi Makinen. Dauncey provided the following picture and caption to the above Pug. Basically, Peugeot built a rally car with Formula One aerodynamics. That's so insane you just kind of have to love it.